My first journey in 2011 to Iran was only by bus and train – and I returned by air plane. The next year, 2012, I decided not to use the air plane and “added” hitch-hiking or auto-stop instead, when I went to Scandinavia via Eastern Europe and Russia. 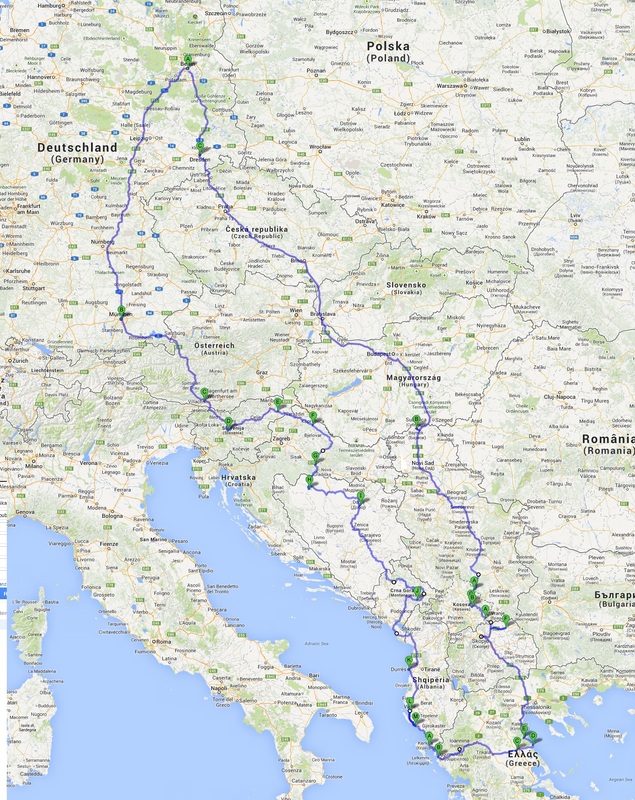 After I started hitch-hiking in Germany as well and already made more 10’000km I decided on a Balkan tour ONLY by auto-stop. The Balkans were the Ex-Yugoslavia countries Slovenia, Croatia, Bosnia and Herzegovina (BiH), Montenegro (Crna Gora), Macedonia (FYROM), Kosovo and Serbia. But due to the little distance I went to Albania and Greece as well. In total I was on the road for 38 days – from the 1st August till the 7th September 2013, covering about 5200km. Apart from about 200km, I only travelled using auto-stop / by hitch-hiking. Just the last stage from Dresden to Berlin I could stand the waiting time, the bad spot and people who don’t want to take someone in their empty car any more and took the bus. At least I did it to Germany. From the 37 nights I spent 17 nights in my tent from which 8 were in the nature. The others I did Couchsurfing or was invited to stay at people’s houses. Because this time the journey was the reward (doing auto-stop was main my intention and not visiting cities/towns) don’t expect exceptional photos. I had great experiences, but they don’t fit on photos…. A huges thanks goes to all who helped me in any form while travelling!